A square in central Paris was named on Monday after the leading Moroccan political opposition activist, Mehdi Ben Barka, who had disappeared without trace after being picked up by French police in 1965. Bertrand Delanoe, mayor of Paris inaugurated the Ben Barka Square, during a gathering to commemorate the 40th anniversary of his abduction. His body was never found. 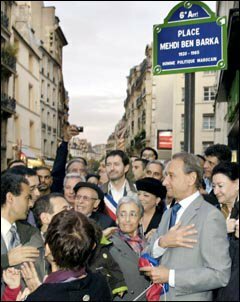 Paris Mayor unveiled a plaque on which Ben Barka's name was written, in the presence of his widow and four children. Delanoe said that "Paris does itself justice when it manages to look back at its history with a concern for the truth." Meanwhile, Bachir Ben Barka, son of the late opposition activist expressed his gratitude and pride on Monday over this tribute. Ben Barka, who was a leading Moroccan political opposition activist, was abducted in mysterious conditions in Paris, France, on Oct. 29, 1965. His body was never found. Reports said that the Moroccan secret services, French intelligence and the criminal underworld have all been involved in the affair, but the facts have never been fully clarified. Ben Barka had been an active militant for 30 years. An outspoken opponent of the late Hassan II, he was twice exiled, first between Jan. 1960 and May 1962, and then in June 1963. After his abduction, two French officers were jailed for their role in the kidnapping, but the judge ruled that the main guilty party was the then Moroccan Interior Minister, Mohammed Oufkir. A former criminal, Georges Figon, who testified to having seen Oufkir stab Ben Barka to death, was later found dead, officially by suicide. The Ben Barka affair damaged the image of both Moroccan and French governments during the last decades. Ben Barka's family was allowed back into Morocco in 1999 after 36 years in exile. In 2004, France agreed to release the 73 documents of the case, which were published in the French Official Journal. The first request to declassify the files relating to this affair was made in 2001, and the Defence Committee allowed only limited information of the state's secret to be released. The issue has since then attracted the interest of Moroccan civil society actors and politicians, as well as international organizations, including Amnesty International and the Human Rights Watch. Last Saturday, the Moroccan leading political party, the Socialist Union of Popular Forces (USFP) organized a national day to commemorate the 40th anniversary of Mehdi Ben Barka's abduction and assassination. The event, themed “to unveil total reality”, was held in Rabat's Mohammed V theatre. During the same day, activists of the Moroccan Human Rights association (AMDH) and relatives of disappeared political activists demonstrated in Rabat to mark the anniversary of Ben Barka's disappearance. The posters held by demonstrators read 'No to abduction. No to torture'; 'I want to know what has happened to my brother'. Ben Berka's mysterious disappearance has been brought back to the screen by Serge le Peron, whose film was released on Thursday in France. The French-Spanish-Moroccan production, entitled “J'ai Vu Tuer Ben Barka” (I saw Ben Barka Get Killed), sheds light on the most enigmatic demise in Moroccan history. The directors of the film, Serge Le Peron and Saïd Smihi, chose Figon's death as a point of departure for the story, affirming that the film is not going to portray Ben Barka's life. Georges Figon, had testified to have seen Moroccan Interior Minister, General Oufkir stab Ben Barka to death. The directors have chosen the French actor Simon Abkarian, of Armenian origins, to play the role of Ben Barka. The two directors want the film to be simultaneously shown in France, Spain and Morocco.